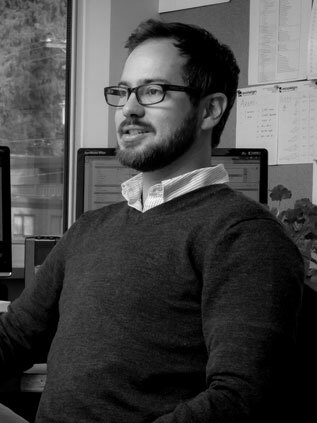 Adam Schroyen | Adam Schroyen | Ecosign Mountain Resort Planners Ltd.
Adam Schroyen is a graduate of the University of Victoria’s School of Architecture (New Zealand). From previously working in an architectural firm that specialized in medium and large scale educational, residential and commercial projects he moved to Whistler and has now worked as a Resort Designer in Ecosign’s Base Area Planning Division since 2007. Over the past 7 years, Adam has collaborated on many of Ecosign’s base area developments around the world including projects in China, Eastern Europe, Russia, Scandinavia, North America and Japan. These include design schemes of varying scales from entire new resort developments such as the Mountain Village for the 2014 Olympics games in Sochi, Russia, to conceptual building design for a new daylodge building and parking structure at Silvretta Nova in Austria. In 2008, as part of the development for a full scale new ski resort village in Hokkaido, Japan, Adam and a colleague spent 3 months working onsite to collaborate and coordinate with Japanese architects and engineers to form a masterplan that responded to the local culture and environment. The first phase was completed in late 2009 with the construction of the “Hanazono 308” daylodge building. Construction for the remaining village and surrounding real estate is ongoing. Since 2010, Adam has been deeply involved in the design and development for a 4-season ski and golf resort in Changbaishan, Northern China. This project was positioned to be the first of its kind in China, and consisted of developing a greenfield site into a 7,000 a day ski operation with a retail village, flagship hotels, 1,000 seat performing arts theater, 2 championships golf courses and 600 surrounding residential villa units. Adam joined meetings held in Beijing to co-ordinate with the client, selected architects and Chinese engineers to work together and solve the many complex and logistical problems associated with a project of this scale. The resort successfully opened to the public on schedule in the summer of 2012 and has since become a model for the future of ski tourism in China. 2005 Graduate of the Victoria University Of Wellington, New Zealand; Bachelor of Architecture (Honours).